During my winter vacation on the ski slopes of Colorado, in the midst of making good memories with family and friends, I found the time for reflection and gratitude. I have much to be thankful for, and I want to begin Merchants Bonding Company’s 80th year in business with thanks for past partnerships and loyalty, with excitement for future growth; and with pride in the success we’ve had despite some of the worst economic conditions in history. 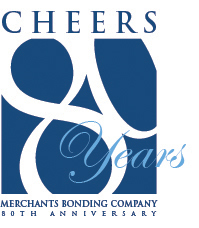 First let me explain our celebratory slogan: “Cheers to 80 Years.” It is not a coincidence that it is a toast, because appropriately, the first bond in Merchants’ history was for a permit for sale of beer. We received a $12.00 check as payment and so began the life’s work of my great-grandfather, grandfather, my uncle, followed by my cousin, Bill Warner Jr. and myself. Four generations of my fam ily, steadily building Merchants Bonding into a top 15 surety, with a commitment to common sense underwriting and first class service. “Common Sense Underwriting since 1933” is the tagline we use here at Merchants Bonding because it is the simplest explanation of what we do; and since we’ve been doing it for 80 years now, we intend to infer that our way is the right way. When you hear the name Merchants Bonding Company, we hope you think of common sense and consistent underwriting, no matter what the market conditions, or which underwriter you work with. If I ask you about your service experience with Merchants, I hope that I hear it’s been first class. And, we want agents in all 50 states to get the message that we have grown significantly in size and expertise; writing bonds both large and small. We’re not the biggest surety (yet), but we are surely among the best. I am fortunate to travel around the country every year. During these trips, I not only meet with agents and other business partners, but I also meet with peers and competitors. I’ve learned a lot from all of them. I am proud and humbled when even those “other guys” that we compete against, go out of their way to compliment me on Merchants’ results. We have consistently grown our market share while maintaining our underwriting standards, which is no easy task, and they’ve noticed.